Let’s get it ‘out there’ right now – I’m A SHOUTER. I’ll be the most demure of theatre patrons all the long year, but come pantomime season I’m an enthusiastic participant and I expect to cheer, boo and heckle to my heart’s delight. So, while I felt it necessary to declare all of the above to the stranger seated to my right last night (it only seemed polite), I was relieved that I had every opportunity to express my panto penchant to excess! Even before curtain up the multi-talented cast mingled - in medieval character - with the audience; geeing us up for the shenanigans ahead. And we didn’t have to wait long to be blown away be the sheer talent on stage. 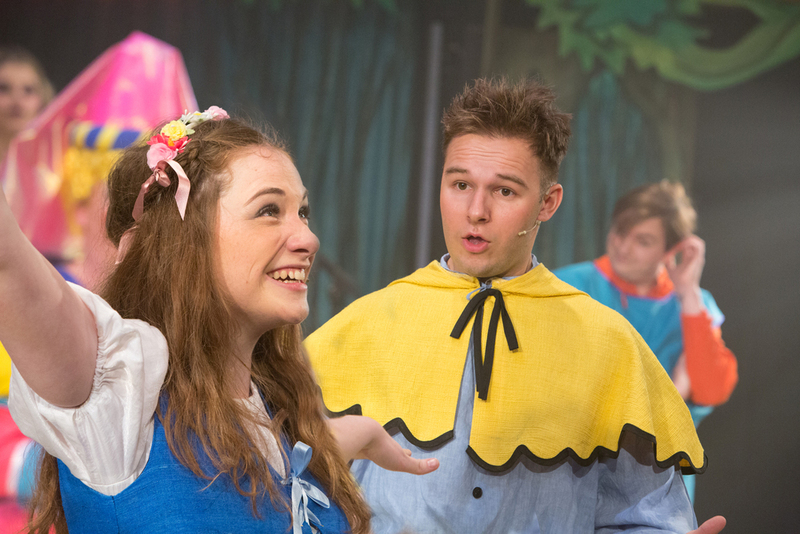 The Sword in the Stone may not, at first glance, be the most obvious of panto stories but the cleverly crafted script offered plenty of chances for the traditional good versus evil tale to burst with clever song choice after clever song choice. 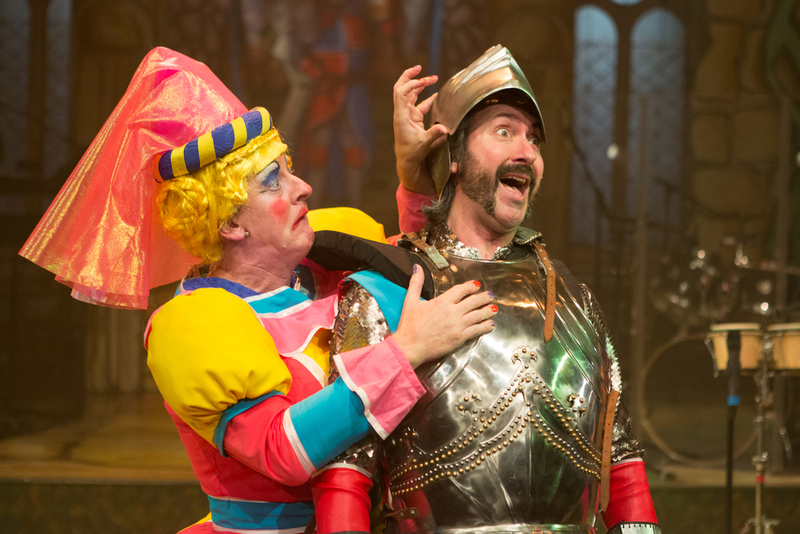 For the uninitiated the hallmark of these Rock ‘n’ Roll pantos is the incredible sound created by the actor musicians and the variety of music performed – this year everything from Queen to Take That via Billy Joel and Duffy – means there really is something for everyone. Sean Kingsley as Merlin had us rapt from the off, his rasping voice reminiscent of Richard Harris and his delivery of the Queen classic It’s A Kind Of Magic rivalling Freddie himself. The young romantic Sprout played by Sandy Grigelis with equal doses of cheeky-chappy and budding heartthrob (reminding me of Ollie Murs) gave us a rendition of Billy Joel’s She’s Got A way that just melted the heart. Graham Kent (Dame Bernadette Broadbottom), Daniel Carter-Hope (Sir Cedric Scuttlebutt) and Kay (Rob Falconer) spoiled us silly with slapstick, hilarity and comic timing by the truck load while Guinevere (Lucy Wells) and Morgan Le Fay (Georgina White) gave the guys a run for their money with show stoppers including I’m Gonna Rain on Your Parade and Rule The World. While each and every audience member will have their own personal favourites for me there we two absolute stand out numbers: Comic genius Steve Simmonds (Mordred) along with Georgina White (Morgan Le Fay) gave us a rendition of possibly the biggest hit of the year – Bruno Mar’s Up Town Funk – a combination of drums, brass, vocals and crazy antics that should be free via the NHS to lift the nation’s spirits. 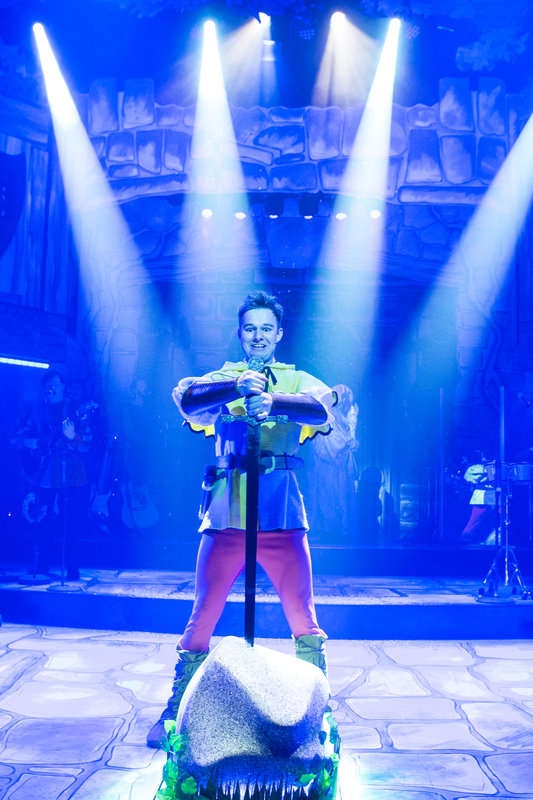 The other, equally infectious and superbly put together, was the four young dudes – Sprout and Kay along with Lancelot (Adam Langstaff) and Sir Gawain (Barnaby Southgate- also Musical Director) – with their take on the Back Street Boys’ Everybody. We’d love to mention every single contribution from those not immediately in view, after all this is a huge creative process and the set, costumes, sound, lighting and effects all play vital roles. 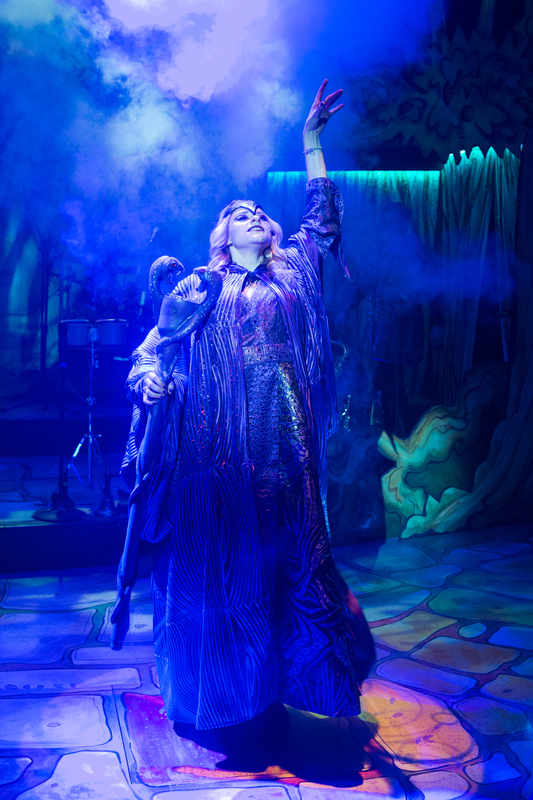 However our final salute goes to the riotous rocking robin, demented head-banging owl and other very animated woodland friends plus of course, the daddy of all puppeteering prowess; the enormous fire-breathing dragon. Book your tickets, strap yourselves in and clap until your hands are numb – this is their best yet.